Come listen to a story, bout’ two miners in the red, a couple mountain boys, barely kept themselves fed. And then one day, while diggin in their hole, out from the ground, come some mighty shiny gold!!!! NUGGETS that is–PURE wealth! Well, I tell ya, and I am sure also I speak for Craig, we feel lucky; very lucky to live in a place like Happy Camp, surrounded by beauty and ruggedness. 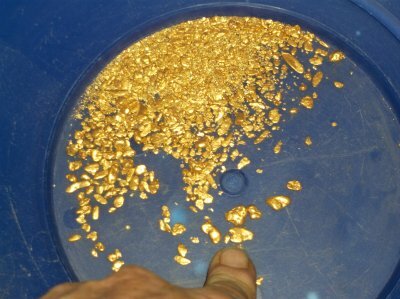 We are lucky to be in an area loaded with gold. And we are lucky to be involved with, and supported by, a group like The New 49ers. We truly love what we do. So, yes; we are amazingly lucky! But as to the locations of where we dig, and about mining in general, sometimes luck must be busy shining down upon other members. Because, since gold is our only source of income, and we are not allowed to use our underwater mining machines (for the moment), there have endured too many nights when Craig and I went to bed hungry. Which is a good place to kinda start our story over again. 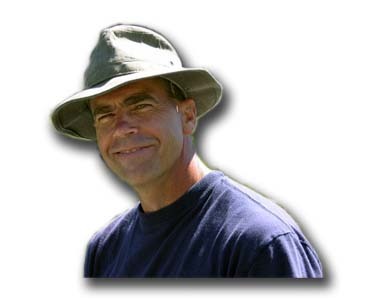 Let’s please just start at the beginning: As many of you experienced in last season’s New 49’er newsletters, Craig and I, along with a bunch of other members, and of course Dave Mack, worked really hard, sometimes defying death (I’m serious about this! ), to put together a huge gravity-powered underwater mining operation. We actually did it! And it worked great! 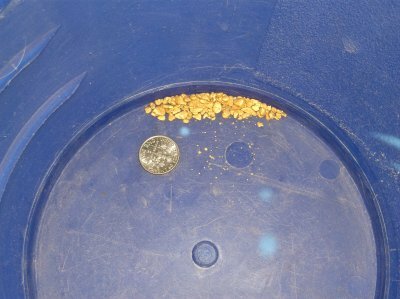 With the extraordinary rich gold deposit already located in that place, we woulda recovered pounds and pounds of gold. We planned to do managed group outings on the deposit to share the glory with all New 49’er members. We had big plans. All our local members were really excited! Except the mountain ran out of water! You know; that stream had plenty of water during the years before. What’s up with that? I admit that I was kinda startin to shake my fist at luck when all our hard work came to nothing at the beginning of last season Especially when a bunch of us were out there dismantling our gravity system! So we built a floating sluice that was large enough to process all the material from a group weekend outing with ease. And yes; it even has a cup holder! But wouldn’t ya know it…Siskiyou County caught on fire again last season. It got so smoky at one point that you couldn’t even see across the river! You cannot do manual labor in smoke like that unless you are working to put the fire out (we have a lot of respect for the firefighters). The fires around Happy Camp cancelled our final two weekend group outings. By this time, I was shakin my fist, cursin a little, stompin my feet at lady luck. So far, this wasn’t a very “lucky” year for Craig and I. After a while, rains extinguished the fires, the smoke finally cleared, we got Craig moved back to Happy Camp from Oregon; and we got another good friend packed up to move away. Nice clean air to breath; boy, the simple things we take for granted! Into Mid December, Craig and I were finally ready to start some serious digging. This was good, cause we were both runnin on empty. Now, you should know that between Craig and I, we have a zillion different places we want to sample for high-grade gold. 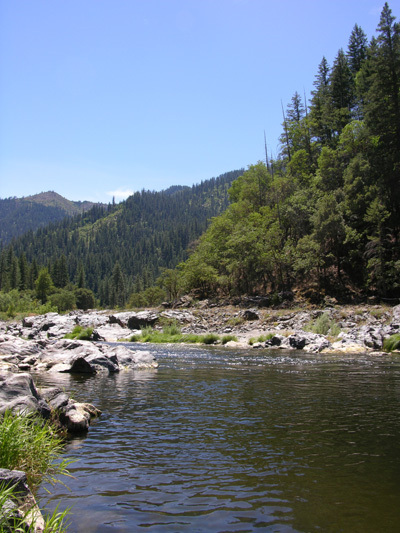 The New 49’ers make so many miles of gold-bearing property available along the Klamath River and its tributaries, there are endless opportunities. But every day we pass this same area; and we always agree the place is worth some sampling effort. It is close to Happy Camp. Several members have found big nuggets there. So, after a short walk-about, we kinda just lined up between where we knew some members had done well and drew an X in the sand. That’s the thing about sampling. In the beginning, you are just guessing and hoping. Sampling close to where others have already found high-grade increases your chances of making a strike. The next day we began shoveling sand out of the way. This was just light material that washes in during the winter storms. We didn’t bother to pan a single-scoop of the sand. We were aiming for what was underneath. We had to shovel off about three feet of sand down to the first layer of hard-pack. Sampling there showed some decent color; but it was not going to feed us for dinner. We were not discouraged. This was a good tight hard-pack laid in by some ancient storm. Craig and I both knew the real test was going to be at the bottom of the hard-pack. This was virgin streambed that has been resting there long before modern man arrived in California. 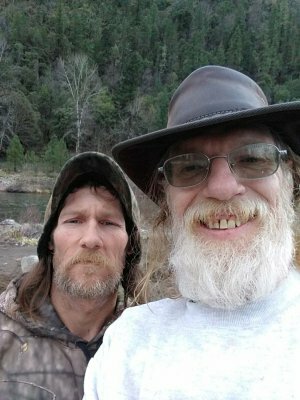 That night I talked to Craig about the metal detecting technique I use when I mine in Arizona. Once on bedrock, I can follow the gold whichever way it goes and often follow it into the raw meat of a rich gold deposit! I run a very sensitive pulse induction metal detector which, for the most part, ignores hot rocks. 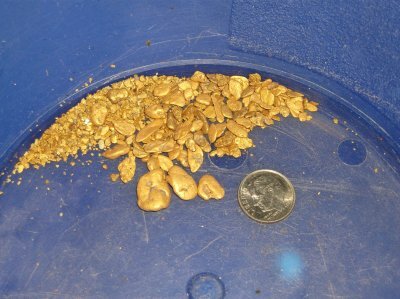 “Hot rocks” are heavy rocks filled with iron material that will make earlier generations of gold detectors sound out similar to a gold target. 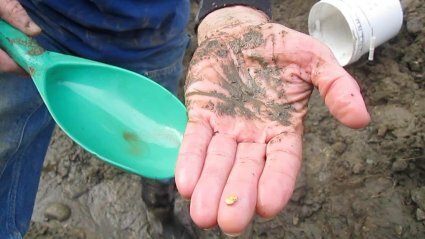 Since they are also heavy, there are usually a lot of hot rocks deposited in and around gold deposits. Up until the recent development of induction pulse metal detectors, electronic prospectors were digging dozens or more hot rocks for every nugget they found. I’m sure glad those days are over! The other stuff that any detector will sound off on is trash. Trash” is a loose term we use for manmade objects like nails, bottle tops, pieces of lead, and all the other metallic stuff that washes down Mother Nature’s waterways during flood storms. Even pulse detectors will not ignore most metallic objects; though, to the experienced ear, most iron objects do not give off a signal that sounds like gold. 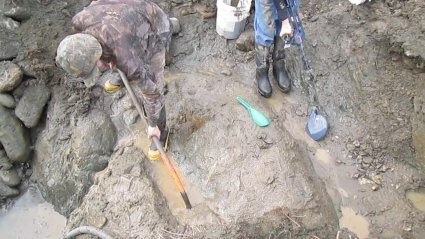 But this hard-packed streambed that Craig and I were digging in looked to be virgin. That is to say original streambed that was present before modern man arrived on the scene. 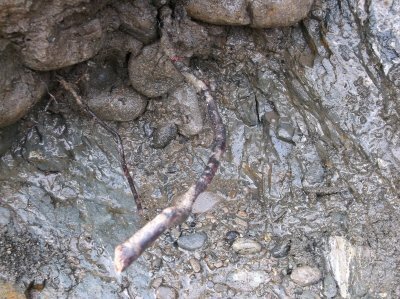 Back when we were allowed to operate dredges (soon again, I hope), we used to uncover virgin streambed on the bottom of the river wherever it was too deep for the old-timers to reach. That’s where the commercial gold deposits remain waiting for us; sometimes extremely rich! We only uncover virgin streambed up out of the water once in a while. Perhaps there was a settlement over this place that is now long gone. The bedrock is full of cracks perfect for capturing gold nuggets during major flood storms! For sure, as we got deeper into the hard-pack, we could see that it was very old. This meant that there would be no trash to distract my metal detector. Very cool! Said another way, if my detector sounded out down in this streambed, it was more likely than not that there was a gold target there. Since the State of California will not allow small-scale miners to use engines or mechanized equipment in pursuit of gold (for the moment), using my detector to search bedrock for gold seemed like it could be a very helpful solution. There was a water table keeping the bottom of our hole mostly submerged. 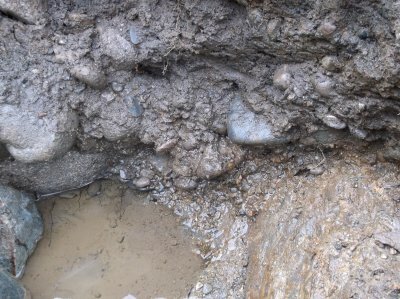 We had cleaned it off as best as we could with our hands and some other tools; but we could still feel irregularities along the bottom where we know the gold nuggets like to hide. So I broke out my pulse detector just to check the bedrock for anything we missed. There was a deep spot on one side of the hole with a slight crack running down right into the bottom; and I heard that familiar sound…” AYE YOU!” At least, that’s how I hear it. Gold has its own distinct sound that is entirely different than nearly all other metallic objects. In fact, experienced prospectors, while hunting in ground which contains a bunch of trash, train themselves to only listen for the sound of gold. Ut in this place!! BOOM BABY!! A NUGGET!!! Then another just a little further up the crack! What can I say. When luck is going your way, you feel totally on top of the world! I don’t care how tired you are, how disabled, how down and out; folks, I’m gonna tell ya; virgin gold nuggets are highly motivational! Craig and I kicked into high gear and we were some diggin and detecting fools! At the end of each day I would detect the bedrock we had uncovered; and each day I was finding 5-to-8 nice little nuggets hiding deep in the bedrock. This is such a cool way to end the work day! Kind of like winning on a slot machine. But so much better, because we were finding pure wealth; Mother Nature’s most cherished and hidden treasure. So far we were just shy of a half-ounce of gold in all. Not bad for 4-5 days of digging. We have done better. But we have done a lot worse. You have to appreciate the high-grade gold when you find it. Some days are going to be better than others. THEN IT HAPPENED! The next day, I started digging: but just wasn’t feelin it. So I fired up the detector and started swingin’…and the detector started screaming!!!! In my experience, there’s two different types of signals: the ones that say” Hey, hello, I might be a nugget, you can dig if ya want” And then there’s” HEY! !DIG HERE DIG NOW!! !” And that’s what I was hearing. It was coming from under a hanging rock still stuck to the bedrock and right in line with where we had been finding most of our nuggets. I started scoopin with my plastic digging tool and nuggets were everywhere! There was a little mud puddle below that rock and I pulled out over 30 nuggets in a spot no bigger than a basketball! We were jumpin up down hoopin and hollerin in exhilaration. Craig and I locked arms and chicken danced around in a circle until we heard someone coming down the path. The person turned out to be one of our very active local members, Mark Turner. He lives up in central Happy Camp and probably heard our excitement and laughter. Mark is also a very good gold prospector. Somehow, good prospectors are able to follow the signals into gold. Hearing us screaming and laughing our hearts out was a pretty good sign to follow! This was what our first 7 days produced! A good detectorist always double checks his hole. Well, I kept checkin and it kept beepin, each time giving up another pure golden nugget. But I was thinking this little hole must surely be cleaned out by now… That’s when it occurred to me… metal detector signals also come from above the coil. So I concentrated on a that rock stuck on the wall, “HEY! !DIG HERE DIG NOW!! !” What the heck! OH BABY! Craig’s tellin me bucket it up and we can get it all in our concentrator at home. I knew he was right about that, but was having way too much fun! I rolled that rock back and there they were; just sittin there — two big beautiful nuggets, with a family of little ones all around. At one point, I had 4 nuggets in my scoop and 3 in my hand. That’s a problem I can work with every day! By the time we had our little honey hole cleaned out that day, we had recovered a little over an ounce in total for seven days of work. 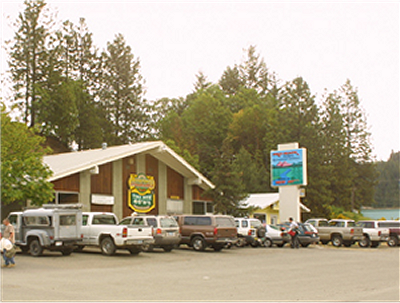 In all, we withdrew over 1 ½ ounces of beautiful gold from the Klamath National Bank. And we were NOT done yet. Since writing this story, we have uncovered more glory holes and are up to just under 2 ounces. And we still have a long way to go! Derek & Craig Finding Gold Nuggets! LUCKY! Darn right we are! Sometimes you just have to wait a while before your good luck catches up with you! Here it is all cleaned up. It’s so pretty, we can’t bring ourselves to sell it. So we are still runnin on empty – but we are loving it! Join us for our Group Mining Projects This Coming Season! After devoting nearly a decade in the California legal system, and more than a million dollars in legal fees, the district court in San Bernardino has dismissed all our claims except the takings case, and the State is asking the Court to dismiss those claims as well, arguing that losing the right to develop a gold deposit that you have located is really not a “taking;” because you still have the opportunity to locate and perhaps develop another gold deposit on your claim. Never mind that it was the location of a viable gold deposit that provided you with the possessory right (valid mining claim) in the first place! Said another way, once the State decided we would not be allowed to develop the gold deposits we had already located, the validity of our claim had been taken away. Waste of time to continue making the argument; because as I have said before, we have finally realized that there is no justice to be had within the California court system. Now the State is asking the San Bernardino Court to award them legal costs for the decade of litigation. The First Amendment of the U.S. Constitution provides us with a right to petition for a governmental redress of grievances. Right? It’s bad enough that the California court system will not allow our petitions an equitable review. I mean that’s really bad for the future of our freedoms! But on top of that, the State now intends to impose huge penalties upon us for seeking redress! They are going to punish us for challenging their misuse of authority. This mindset is what Donald Trump will have to change if we are the make America great again! Note: The New 49’ers saw this possibility several years ago and carefully positioned ourselves to minimize our liability. Good thing! I’m sorry to report that the Rinehart case was rejected by the U.S. Supreme Court. This is unfortunate considering how much effort and money the small-scale mining community invested into it and how far we took the fight. My sincerest thank you to all of you who supported our efforts, especially during the final weeks. It would be something else if we just stood by and did nothing while the anti-America movement is taking our rights away. But our whole industry pulled together and fought this all the way up to the U.S. Supreme Court! The good thing is that all is not lost. I detect that the winds of change are turning in our favor, even it is not being reported in the main stream media. There are a lot of good things happening. It has taken a year for Mr. Trump to get himself settled in and figure out the game. I expect to watch the momentum keep picking up from here. There is another case out of Oregon (Bohmker v. Oregon) which is also challenging State authority to prohibit mining on the federal lands. Oral arguments in front of the federal Ninth Circuit Court of Appeals will take place on the 8th of March. Oral arguments usually take place shortly before a Decision is rendered. Whichever way the Ninth Circuit decides; it is a near guarantee the Oregon Case will also be appealed to the U.S. Supreme Court. That decision will affect Oregon, California and on the rest of the federal lands in America. This extra time is going to allow the Trump Administration to bring his Justice Department more around to looking at the world the way he does, rather than file legal documents intended to prevent Americans from gaining access to the mineral wealth which exists on the federal lands. The Trump Administration is rapidly figuring out who the bad guys are as they move forward on their agenda to “make America Great Again.” More or less, it is the same bunch who have slowed or killed resource development in America are in lock-step with the other progressive policies which are eroding basic American values. Here is just one example of where the Trump Team is feeling around for the drains (to the swamp). National health care, taxes, domestic energy production, immigration and strategic minerals and other issues are of national importance. They will eventually get around to small scale miners. My perception is that the momentum is picking up. Just as an example, here is a news report from CNBC – which is nothing less than a propaganda tool for the world-wide progressive movement. But at the very same time the private sector starts getting on its feet again, California is wasting no time in trying to take away half the benefits. You see the way this goes? We are right in the middle of a non-violent (so far) war between free enterprise and totalitarianism. That progressives want to create a world where their children will need to obtain government approval for everything they do never ceases to amaze me. Here is a landmark case that Pacific Legal Foundation just won unanimously in the U.S. Supreme Court. There remains strong reason for hope. To predict how things will go with our industry, at this point in time, I suggest we have to watch the larger picture of how things are trending. The latest news on how the Democratic party colluded with the FBI and U.S. Justice Department during the Hillary/Obama period is reason for hope. If our side ends up on top of this, I predict a lot of important people are going to jail. Please stay tuned in. We will be sending out Action Alerts once the Bohmker case is forwarded to the U.S. Supreme Court. The law clearly supports our position in this matter. And step by step, Mr. Trump and his growing team is bringing the federal agencies around to the idea that we should be creating wealth, rather than welfare; that productive people are heroes, not criminals; that government workers should be helping us, rather than trying to sink our boats (in the swamp). Swamp? How about this. The State of California is now considering criminal convictions for any restaurant waiters that provide plastic straws to customers unless the straw is specifically asked for! Here it is. Think that’s bad? California is so far gone, it recently passed a new state law – the Immigration Worker Protection Act – employers and businesses can face fines of up to $10,000 if they provide employee information to U.S. Immigration or Customs. Really; this situation is much more important than just immigration. We are sitting on a powder keg! Here it is. There is no fixing something that is so far gone! I predict big, national problems are not far in the future. See how this is coming to a head? Here is another one to demonstrate how far down the road California has traveled. Not enough? Here is another one! Perhaps the only good result of this is that the value of gold should go out the roof. And unless California starts printing its own money, there are not going to be many State employees on the payroll. Those that are, will have much more serious problems to deal with than a small-scale miner minding his own business. Except for helping with several ongoing criminal cases against miners who were prospecting with the use of motors, and helping to eliminate or minimize the liability of attorney fees (to the State) upon the other industry organizations involved in the years of litigation, I believe that ends our involvement in the California courts. Just like we discovered several years ago that lobbying the California political structure was a waste of time, we have also discovered that the same is true of the judicial system. I’m sorry to say that petitioning for a governmental redress of grievances with the State of California is no longer an option unless you are fighting for progressive (socialist) causes. My advice? Stay out of trouble! 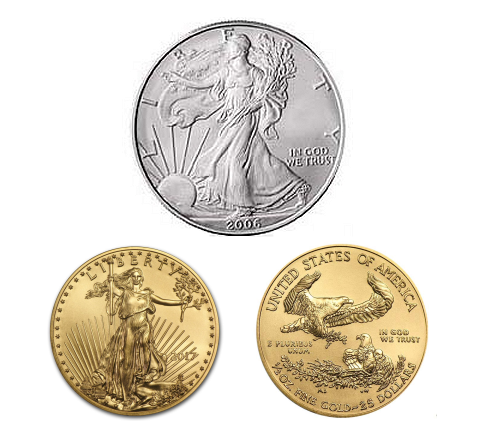 Chance to Win More American Gold & Silver Eagles! The girls in our office just informed me that we have had very little participation so for in this drawing. Only $327 dollars so far; ouch! Since the drawing date is only a few weeks off, I’m hoping you guys will send something in to help support our legal efforts on behalf of small-scale mining in America. Our office will automatically generate a ticket in your name for every $10 legal contribution we receive ($100 would generate 10 tickets). This drawing will take place at 2 pm on 23 February 2018 at our headquarters in Happy Camp. You do not need to be a member of our organization to participate. You do not need to be present to win. There is no limit to the size or frequency of your contributions, or to the number of prizes you can win.